The perfect addition to your nursery or primary school resources, opt for our Gompels Assorted EVA Craft Pack. Supplying you with 520 individual sheets various colours and sizes, this bumper craft pack can be used for a wide range of different tasks. From helping you to create the most engaging and captivating wall displays through to adding 3-dimensional detail to your next project, you'll find them extremely useful. The EVA foam design makes them safe for use by small children while also being easy to cut and shape for all their crafting needs. The pieces supplied can also be used as is to help develop their recognition of different shapes and designs. Shapes supplied: Hearts (200pcs), Stars (200pcs), Flowers (60 pcs) and Leaves (60pcs). 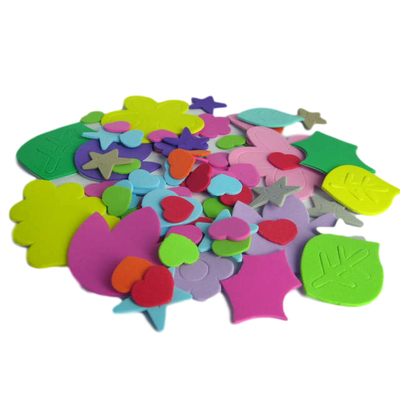 If you're looking for more exciting additions to your crafting box, our EVA Foam Sheets are a fabulous choice and allow their imaginations to run further afield. We also stock large 5 litre bottles of PVA along with our Plastic Glue Spatula's to make collaging as easy as possible and Basic Paper Packs A2, A4 and Card for each and every craft you can imagine.